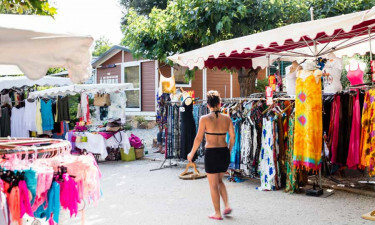 La Baie des Anges luxury camping site is ideally situated just three kilometres from Lecques beach on the French Riviera coastline. When translated, the site name means 'The bay of angels' and it certainly lives up to its name. Enclosed by 25 acres of pretty pine trees and opulent olive groves, this holiday resort is a popular preference for holidaying families. Accommodation on offer includes mobile home options, so why not contact LUX-camp today to get your dream holiday started? Welcome to La Baie des Anges Campsite. What is unique about La Baie des Anges luxury camping? Close proximity to the lovely Lecques beach. A wonderful water park that caters for all the family. Easy access to many surrounding tourist towns. Great sporting activities onsite and nearby. 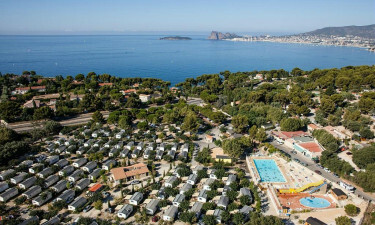 No camping holiday is complete without a super swimming complex, and La Baie des Anges park does not disappoint. While you are not leisurely kicking back in your luxury tent or mobile home, you are sure to be enjoying this swimming sensation. The main swimming pool is a cool 25 metres long. Onsite staff organise swimming lessons and aqua gym classes for keep-fit enthusiasts. For children, there is a double-lane water slide, while toddlers will love playing in the paddling pool. The park is conveniently close to the sandy shores of Lecques beach, one of the many local tourist hotspots. Pack a family picnic and spend the day listening to the crashing breakers of the blue Mediterranean Sea, or take a relaxing stroll along the sandy shore. Catch up on your tan while you take the kids for a dip in the water - or simply soak up the rays as you watch them play. 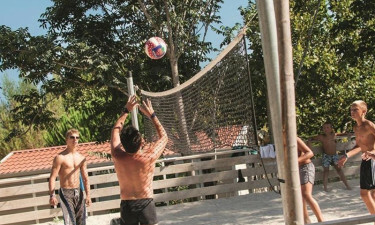 If you are up for something a little more active, you might like to try a spot of windsurfing or maybe participate in some beach volleyball. La Baie des Anges Campsite is only 78 kilometres away from the romantically inspired town of Port Grimaud. This architectural experiment is home to Provencal style architecture, with houses built alongside a network of beautiful water channels with dainty little boats moored up at the front. The town is also known as 'Little' Italy' or 'The Venice of Provence' because it bears so much resemblance to that city. The houses are painted in soft pastel shades and finished with original wooden shutters. La Baie des Anges holiday resort has an onsite restaurant with an interesting menu that caters for international taste. There is a resident pizzeria as well as a take-away service and a lively bar. The park has a mini-market that is well stocked with everything you could possibly want to make your family camping holiday a memorable one. Enjoy some traditional French fare by way of fresh bread and pastries and do not forget the wine.